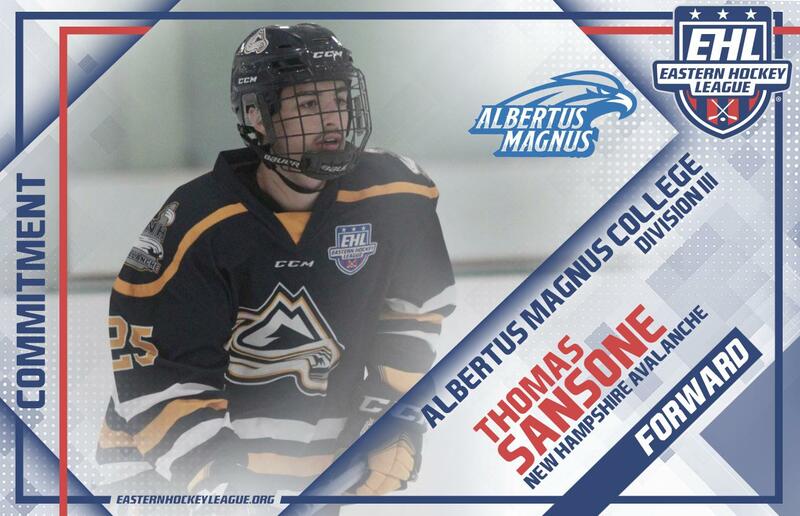 HOOKSETT, NH -- Thomas Sansone, a forward for the New Hampshire Avalanche, has committed to Albertus Magnus College for the fall of 2019. The '98 native of Massapequa, NY is in his first season with the Avalanche, and to date, he's tallied 13 points through 14 total games in the Eastern Hockey League (EHL). "I am very happy for Thomas; he came to us and needed to put some time in both on and off the ice," said Avalanche head coach and general manager Chris Cerrella. "He had to get some college courses done and change some things that no other programs helped him focus on to improve. It was a little bit of an uphill battle for him, but he has really come a long way. Thomas really earned this opportunity and I could not be more proud of him. Sansone can skate and get around the sheet, and I think if he continues to believe in himself and be a complete player, he is going to be a good addition to something new and exciting at Albertus. I wish him nothing but the best of luck and look forward to coaching him the rest of the season." As Cerrella mentioned, Sansone truly earned this opportunity, battling through an injury this season as well. Overall, the veteran forward has improved with each and every day that he's been a part of the Avalanche program. Sansone is beyond grateful, and can't wait to see what the future has in store for him. "I first want to start by saying thank you to my family members for everything they have done for me and all the support they have shown," said Sansone. "I also want to say thank you to the New Hampshire Avalanche organization, Coach Cerrella, Coach Martiniello, and my teammates for pushing me to work hard both on and off the ice. Lastly I want to thank Coach Wallack and his staff at Albertus Magnus for the opportunity to fulfill my dream of playing NCAA college hockey and be part of the Albertus academic community." Sansone is getting back to 100%, and looks to play a key role for the Avalanche as they push to defend their 2018 EHL Championship. New Hampshire is 25-5-0 in their first 30 games, and they currently sit at the top of the New England Conference. However, the schedule is tough from here on out starting with matchups this week against the New England Wolves, the East Coast Wizards, and the Philadelphia Revolution.